At 45 kilometers from Bukhara is a small ancient town Gijduvan. From ancient times to the present day Gijduvan known as a shopping city and the center of craftsmanship. But still, pottery is unique among the various crafts that flourish in town. 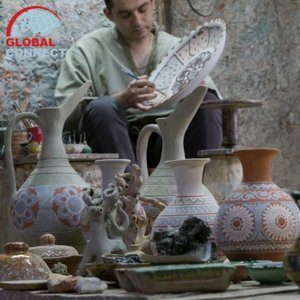 Gidjuvan school of ceramics characterized by the use of geometric forms and colors in ornaments. Pottery of Gijduvan is light, porous, thick-walled. There all shades of yellow and brown, slightly dilute green and blue. Any frills - tableware monochrome. It also uses a dark color glaze over the finest dark pattern. The main color "absorbs" all the others and creates a "marble" effect. 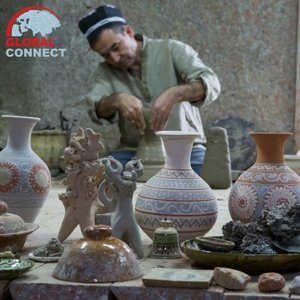 Gijduvan - ancient pottery center, where skilled craftsmen transfer their craft from generation to generation. Now there is, for example, has been running for the 6-th generation of the potters Nasrullayevs. 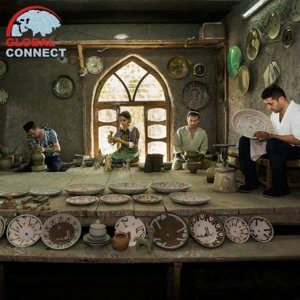 Nasrullayevs are famous in Uzbekistan, they have a large workshop, where you can not only buy the dishes, but also look at the process of production, as well as learn from the work of the potter's wheel. All dishes of Gidjuvan - handmade. Turning over each, you can see traces of the potter's wheel. Gidjuvan masters use special paint only from natural materials, which still make up and cook manually. Colors of Bukharian ceramic are chosen separately. These are the colors of ancient mosaics of Bukharian madrasas and mosques. 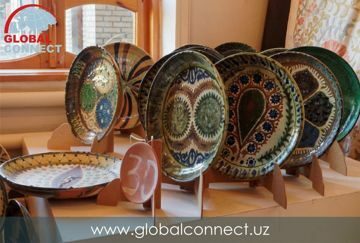 Unlike other well-known ceramics school in Uzbekistan - Rishtan school, on products which, each line of the pattern extremely, thin and sharp-edged, in the products of Gijduvan or Bukhara schoollines are blurred. Properties of their special paint patterns are such that they interact with the substrate coating, slightly blurred. This properties creates an amazing effect when slowly away from the viewer, the images become voluminous. Many “lyagans” (large dishs) are in the bottom three shallow holes, connected by a submerged ceramic - for strings - is that beautiful lyagan can be hung on the wall, taking off for a special occasion. That is, it is the dishes and decorations.